Jacket potato was always something I made as a lazy dinner, I'd just stick the potato in the oven and find something in the fridge or cupboard to pair with it for a simple and filling meal. 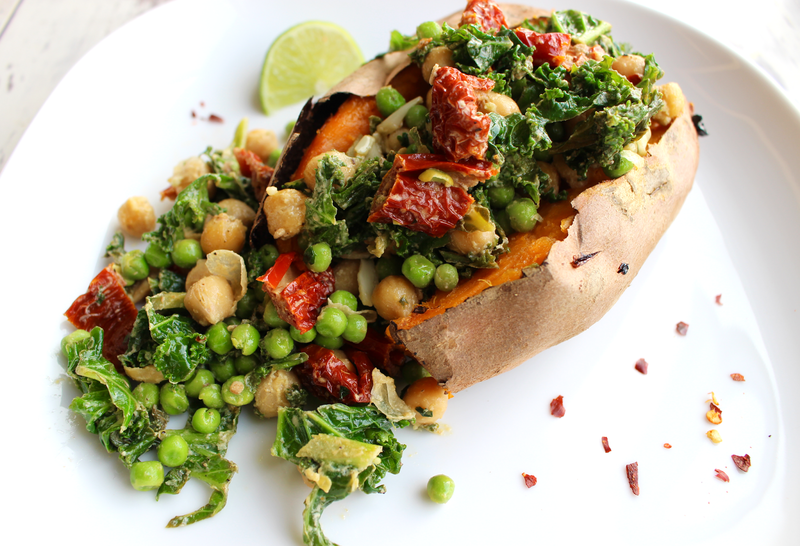 As I've got more into food I've become obsessed with sweet potatoes - they're far more nutrient packed than regular potatoes, don't leave me feeling sluggish and I prefer the taste, so baked sweet potatoes have become the substitute for jacket potatoes in my house and they're oh so delicious! 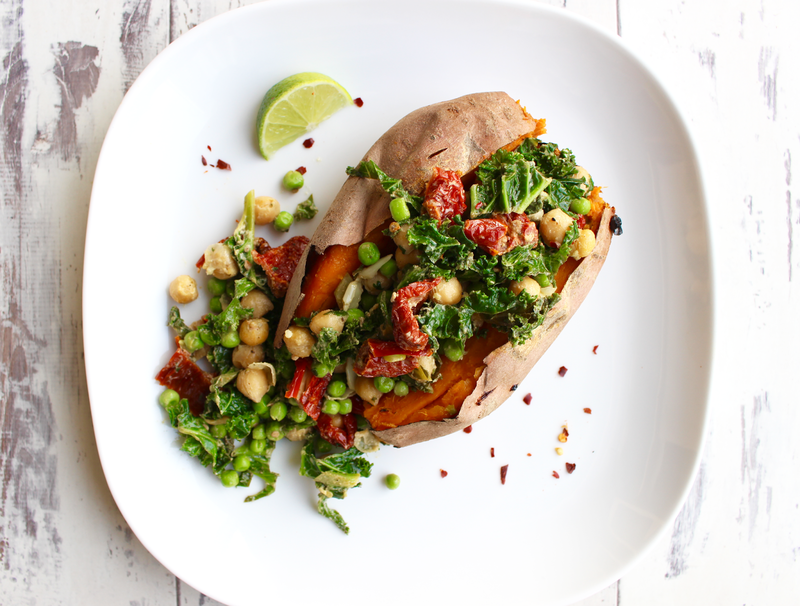 I thought I'd share with you one of my absolute favourite ways to cook baked sweet potato so you can enjoy this simple, comforting, scrumptious meal too. 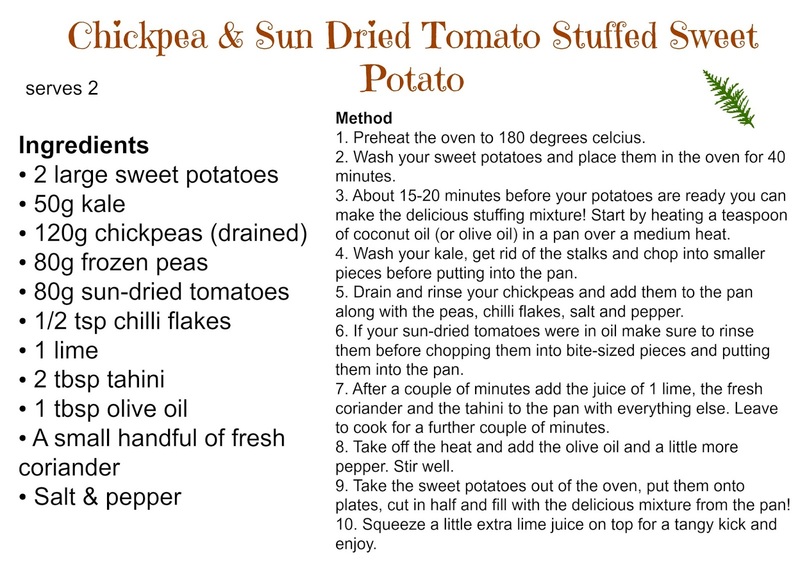 This recipe kind of occurred by accident, I was looking for a super easy and comforting meal so decided to stick a sweet potato in the oven to bake and rummaged through my fridge for things to pair with it. The outcome was so tasty I had to make it again and write down everything I used for future reference (and share with you!). I love how much flavour, colour and texture this dinner has and how satisfying it is too. It's also ridiculously easy and crammed full of plant goodness! Sweet potatoes are a real superfood in my opinion! They're loaded with amazing vitamin A which is essential for strengthening your body's immune system and helping you have the brightest, glowing skin. They also pack in a whole load of beta-carotene, making them a powerful source of anti-oxidants. Not only this but they can help regulate blood sugar levels and aid digestion. I pair my sweet potato with a delicious combination of kale, chickpeas, sundried tomatoes and peas that all help to make this meal even more filling and provide your body with energy, protein, vitamins and minerals. The flavours of tahini, lime, chilli and coriander compliment everything else so perfectly and every mouthful is heavenly!